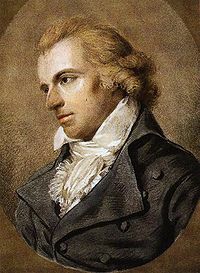 After Goethe the great of German Poets, began life as a surgeon in the army. In his twenty-second year he produced his first drama, Die Räuber ("The Robbers"). Some passages in it betrayed the "cloven hoof" of revolutionary, or at least democratic, bias, and he brought upon himself the displeasure of the sovereign Duke of Würtemberg, in consequence of which he was forced to leave Stuttgart. His principal damas are Wallenstein, Wilhelm tell, Die Jungfrau von Orleans, Maria Stuart, and Don Carlos, of which Wallenstein is, usually placed first in merit. Even greater than the dramatic power of Schiller is the genius of his ballad poetry, and in lyrical inspiration he is the equal of Goethe. Das Lied von der Glocke ("The Lay of the Bell"), one of his most widely-known ballads, is also one of the most beautiful of its kind. In prose literature, his Briefe Philosophische ("Philosophical Letters"). and his correspondence with his great poetical rival, are the most interesting of his writings. "Musst du Tod und Jammer senden,"
Ruft er, "bis herauf zu mir ? As a sacrifice they bring. Honored is the Holy One!" And the germ soon swells amain. To let his deadly arrow go. Th' ancient mountain spirit soars. This tortured creature from the foe. "Death's darts," cried he, "and lasting woe ? "Why not let my flocks alone? Wreathe in a garland the corn's golden ear! Changed the rude tents' ever-wandering home. Desert lying, each broad field. Billow-cast on that wild strand! Ah, no verdant plain then smiled! Give of godlike worship proof. Human bones alone e'er dry. Sorrowed she o'er man's deep fall. Upward towards the heavens ascend? Wanders he without a home?" "Does no god compassion feel? Raise him from his deep disgrace? My tormented heart must prove." Move their sacred course along." Stands she, as a goddess bright. Waves it like a golden grove. That thou lov'st this offering well! High above in circling rounds. Melt their rude spirits, untutored and strong. Gladly and meekly, instruction divine. All the hidden powers of Styx. Skilled in clay and brass's use. Was the ploughshare first revealed. And the godlike host commands. In the holy ring is seen. Crashing down the pine-wood flies. By her skilled hand gracefully. And the might of melody. Softly stone unites to stone. Stand in festal pomp arrayed. To the shepherdess most fair. Blessing their love's sacred fires. Through the friendly open door. Each wild lust that lingers there. Can he freedom gain, and might." With it, the Cyane blue intertwine! Her who the earth's kindly mother is found!